This video simply explains why keeping the net neutral is so important… To have your voice heard, you may leave a comment for the FCC at this link and sign the White House petition here. The story is told by photographer Charles O’Rear, a resident of nearby Napa Valley, California. As Microsoft finally puts Windows XP out to pasture, here is an interesting story about one of the most viewed photographs of all time. So, if I were looking for a SmartPhone today, I’m certain that the all new HTC One (M8) would be at the top of the list. I’ve had the HTC One (M7), last year’s model, since the day it came out last year. I’m not in a contract position to be able to upgrade to the M8 now, and there will probably be an HTC One (M9) by 2015, so I’ll probably be skipping a generation of phones. There are some things I’m able to take advantage of now, with a download of HTC Sense 6 from XDA Developers specific to the M7. Sense 6 is an improvement over Sense 5.5 in several ways. I like the theme capabilities, and the ability to change system wide fonts. The built-in apps (Calendar, Contacts, Mail, etc.) are all improvements over the previous versions. The first Custom ROM I loaded from XDA was the Elegancia ROM which seems to work well enough. However, one app I do have a complaint about is Gallery, which, for some reason, no longer has the social aspects (Facebook, Flickr, Dropbox) that it had in Sense 5(.5). I don’t know why this was functionality was removed, but it reminds me of when Microsoft did virtually the same things with Windows 8.1. Windows 8 had the same type of photo collection ability. Want your Facebook photos? They’re there. Flickr? Yup. I wonder if making these collections available somehow violated Facebook/Flickr’s terms of service…. Just a thought. At any rate, I think I’m gonna reflash and go with Android Revolution 61.1 which is also based off of Sense 6 and see if that behaves any differently. Also, live wallpapers did not work in Elegancia either. At any rate, back to the M8. If I were starting from scratch, which I’m not, and if I had unlimited funds, which I don’t, I would be picking up an HTC One M8 as my next phone. Check out Timely Alarm Clock! So I wake up this morning and head to Google, as one usually does on a Monday, and notice that the Google home page has a familiar look to it. After a few minutes of mouse hovering I discover that the cause of today’s Google salute is that March 11 is Douglas Adams’ birthday. 61st birthday this year, to be exact. Or would have been, had the author still been alive. So, I stumbled across this video using Frequency, an app for finding interesting videos from lots of social sources. Tom Chi speaks about “rapid prototyping”–basically, using simple components comprised of what you can find within reach–to build a rough sample of a functional product. Google glass? One day. A hands-on interface for Google glass? 45 minutes. Apple is introducing Siri on its iPhone 4S. 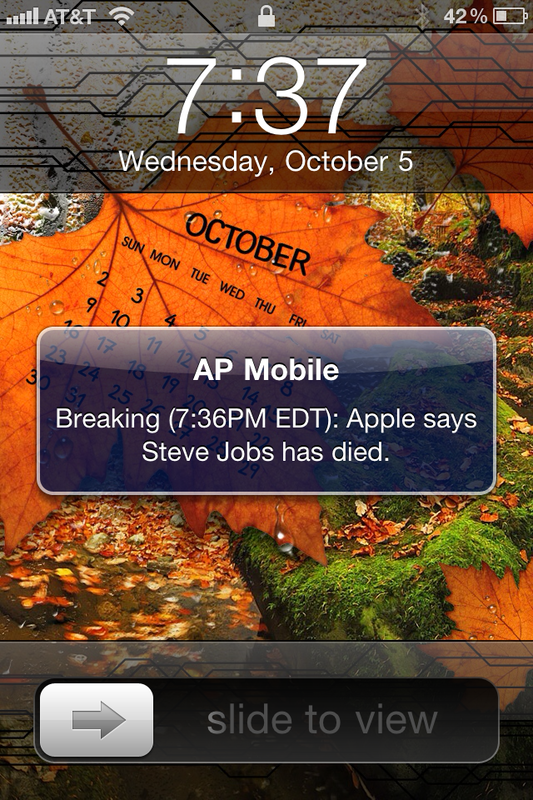 Breaking News: Apple says Steve Jobs has died. I’m glad I had enough presence of mind to snap that screenshot on the left. There’s just a bit of irony in that snap shot. I don’t really know why I feel the need to type out a little blog post on Steve Jobs’ passing. I don’t consider myself the typical Apple “fanboy.” I do enjoy using my iPhone and an iPad, but I work on Windows servers and workstations. I am Microsoft Certified. I am playing with the developer preview of Windows 8. I’ve always been a “Microsoftie.” But… hold on… that’s not 100% true. Back in the 80’s, before I became a full-fledged “Microsoftie,” I was an Amiga fanatic. Those computing days in the 80’s were like the wild west of the tech days. To rip off a line from the Hitchhiker’s Guide to the Galaxy, by Douglas Adams, in those days, men were real men, women were real women, and small furry creatures from Alpha Centauri, were real small furry creatures from Alpha Centauri. At the time there were several different big names in the personal computer field, most of them big names who were famous for hardware development. IBM, Commodore, Apple, Tandy, and others, all mainly focused on hardware. No one really saw the benefit of software until Microsoft came along. What they sold was abstract. “An Operating System? License an Operating System? Why on earth would you want to do that? It’s just a bunch of 1’s and 0’s! The money’s in hardware!” Well, we see where that ended up. The one statement I would like to say about 80’s computing is this: We, as Americans, really like to romanticize when it comes to our history. Contrary to what Disney World and CNN will tell you it wasn’t “the solution comes in 1977 in of all places a garage in California.” There was an awful lot of battling that went on in the 1980’s to gain control of the personal computer market, and Steve Jobs was only one of many major players. My second computer was a Commodore 128 personal computer and when the time came for the next computer, it was clear where the market was headed. Bigger, faster, stronger… I had gone from a PC with 16K of memory to one with 128K of memory and it was only going up from there. The hardware life cycle had begun. I specifically remember picking apart a couple of editions of COMPUTE! magazines trying to decide what my computer was going to be. It had come down to a choice between an Apple IIGS and a Commodore-Amiga 2000. As I’ve previously mentioned, I ended up going the Amiga route. I was a big fan of Amiga computers from the beginning. It was intuitive. I’ve spoken about it before on my blog, so I won’t get into all of that again, but my point of saying all of that is to say this: Brand loyalty amongst technology enthusiasts is fervent. It’s almost religious, in a sense. I’ve often heard Apple fanatics referred to as a “cult” and I can see how that word applies. I always wanted to see the Amiga computer succeed because I knew how good the technology was. And I was truly getting sick of hearing about IBM and the clones and compatibles finally being able to do, in the 90’s, what the Amiga was doing in the 80’s. I guess you could say I could “Think Different,” I just did it differently. Anyway, the Apple IIGS was the closest I got to buying an actual Apple product for the next 20 years. I had firmly sided in the Amiga camp in the late 80’s, and for most of the 2000’s was trying to avoid Apple products by fiddling with Windows-based music players. (By the way, does anyone remember “Plays For Sure?” Yeah, that didn’t work out. Probably because it very rarely “played at all.”) On December 15, 2008 I bought my first ever Apple product, an iPhone 3G. Even then I was leaning towards a Windows mobile phone because I wanted it to be Microsoft. I wanted Exchange syncing in particular. Once I learned the iPhone could do it, I relented. I have been quite pleased with the way Apple products “just work.” I probably should have taken the hint from Douglas Adams back in 1989 when he wrote Frank the Vandal. Any computer guru who wants to know how regular people feel about computers should read that short story. My final thought is simply this: Steve Jobs and Apple struck gold with the iPod, the iPhone, and recently, the iPad. When the iPhone 4S ships in just a few days, it will be a success. The new features like Siri are great for sure, but keeping things simple and intuitive have been the keys to Apple’s success all along. Steve had a knack for figuring out exactly what people wanted before they even knew they wanted it. And it just worked. I can’t tell you anything at all about another man’s soul. And I don’t want to think too hard “religiously” about this, but I truly hope that somehow, somewhere, Steve Jobs is having a great chat with Douglas Adams right now, and I’d love to hear that conversation! I would also recommend this video that’s been quoted often this evening on television news. I’ve heard it several times before, but it has a new meaning for me tonight. This past weekend I received a quote which said “Focusing on the tiniest details, finding magic in even the smallest inspirations, embracing the briefest moments-that’s where passion is.” — from The Power of Small by Linda Thaier. I think Apple has dominated in finding magic in small inspirations, and as they continue on their quest to “Think Different” I wish them the best. As Gizmodo put it, this is probably the weirdest, goofiest video NASA ever made. Some of the physics experiments are pretty interesting. From The Astronaut’s Guide To Life In Space from NPR on Vimeo.